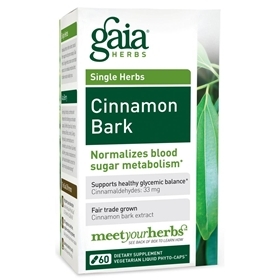 Cinnamon bark helps support a healthy glycemic balance by supporting healthy blood sugar metabolism. Gaia Herbs uses dual extraction technology to deliver the broadest spectrum of herbal constituents: Solvent-free supercritical CO2 extraction, yielding fat-soluble Cinnamaldehydes, and water and alcohol extraction, capturing water-soluble Phenolic compounds. Not to be used during pregnancy or lactation. Keep away from children. If you have a medical condition or take medications, please consult with your doctor before using this product. Use only as directed on label. Safety sealed for your protection. Keep bottle capped at all times and store in a cool dry place. Natural separation may occur. This does not affect product quality.